Over at Fox In Flats they surveyed 150 mums and found that so many of them put their hair up in a pony most of the time because it is simple and easy. When you have children having a shower without interruptions is hard. Getting to also do make up and hair is sometimes impossible. 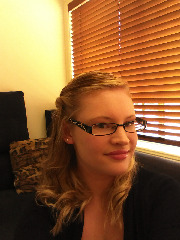 Last week I saw on Glossy Beauty that the gorgeous Ingrid did the hair challenge and I was so inspired to do it too. Her hairstyles were cute but some were also simple but different, because some days you just can't be bothered to spend 40 minutes curling or straightening your hair. So today is my first day in the hair dare. Because I washed it today, I decided to leave it down. Because my daughter was having her morning sleep I was lucky enough to get to curl my hair! I twisted the front sections when they were still wet (because I was too impatient for them to dry) and then towel dried the rest and used my Remington "Purfect Curl" Wand to create the curls then brushed them out to be softer curls. Is anyone else tempted to try the hair dare this week or next? You look lovely! I have been inspired to try this too, at some point, I have Ingrid to blame, ahem, I mean thank for that! Haha, Ingrid, you and Amy have totally inspired me! MM You should do it! I would love to see what you come up with. I'll try my best, stay tuned! I love longer hair, the curls are so pretty and fun!